A new force is shaking things up in Indian politics. In December, the new Aam Aadmi Party (the ”Common Man Party”) contested the Delhi legislative assembly election and won 28 of the 70 seats. This led to the formation of an AAP-led minority government with conditional support from the Indian National Congress. The novice party represents a promising third front in a political context which has been dominated for more than 30 years by the Congress and the hindu-nationalist Bharatya Janta Party (BJP). The genesis of the party comes from the popular India Against Corruption movement that had been demanding a Jan Lokpal Bill (the establishment of an ombudsman for the people) since 2011. The current leader of the AAP in Delhi, Arvind Kejriwal, was an important activist in the anti corruption mobilizations together with Anna Hazare. However, they had diverging visions about whether or not the movement should somehow engage in politics and transform into a political party. While Mr Keijriwal strongly backed a politicization of the movement, Hazare did not, advocating instead for pro people politics from outside. Both are interesting and valuable positions but the two exponents agreed they were irreconcilable. 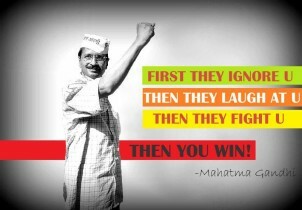 The movement then took two separate paths and the Aam Aadmi Party was founded in November 2012. The party’s symbol is a broom, meant to represent its mission of cleaning up Indian politics from corruption, backing up claims and struggles of the most disadvantaged and impoverished people and towards a future based on Swaraj, an idea of self-government coming from Gandhian thought. The AAP manifesto addresses many issues of social and environmental justice, such as access to water, affordable electricity, health and education. The AAP government has come into power with a promise that it will supply about 700 liters of water free of cost to Delhi residents. It promised that the government will cut electricity prices by half, which has been achieved. The newly elected government has also ordered investigations into electricity supply companies. In response to corruption in the Delhi Jal Board (Delhi Water Supply Board), the new government has suspended three officials. A major reshuffle has also been done to make water supply smooth in the city. Over the past month in the lead-up to the elections, the AAP has gained official support from large social and environmental movements in India; the Narmada Bachao Andolan declared full support on January 13th in Delhi with many dam-affected people from the Narmada Valley being present. The people affected by dams in the Himalayas are also looking at the new Delhi Chief Minister with hope; SANDRP, Matu Jan Sangathan and other social movements sent him a letter asking for fair policies on water and rehabilitation to those people affected by the Tehri dam, a large project intended for taking water to Delhi. The National Alliance of People’s Movements (NAPM) held a special meeting on January 16th and 17th to discuss support to AAP; and an internal monitoring committee will be established for ensuring coherence and accountability of NAPM members who will finally contest national elections under the AAP banner. Notwithstanding this, people’s optimism is high; in rural areas, where population is heavily affected by land acquisition, displacement and pollution, AAP memberships among tribals and most disadvantaged groups are mounting and many activists from local social movements are considering becoming active members and even become candidates for next elections. All conditions are there for the birth of a third political front in India, which can support the many social and environmental struggles going on in the country through real participation and more effective democracy.